Although the area of your floor is measured in square feet, the carpet to cover that floor may be sold by the linear foot. Carpet manufacturers and retailers often don't provide any information about what a linear foot really is. In fact, "linear foot" is just a slightly different way to measure the area covered by the carpet. If you know the width of the carpet roll, you can calculate the number of linear feet of carpeting you will need for your floor area. Calculating linear feet allows you to buy the right amount of carpeting. Measure the width of the carpet roll in feet if you have access to it. If not, call the manufacturer or retailer on the telephone and ask them for the width of the carpet you intend to use. Write down the width of the carpet roll. Measure the length and width of the room you will be carpeting. Include any oddly shaped parts or protrusions, such as a fireplace. Draw a scale representation of the room on the graph paper. For larger rooms, use a scale of one square of the graph paper (1/4 inch) to 1 foot. For smaller rooms, use a scale of two squares (1/2 inch) to 1 foot. You can use whatever scale works for your room; just be consistent. 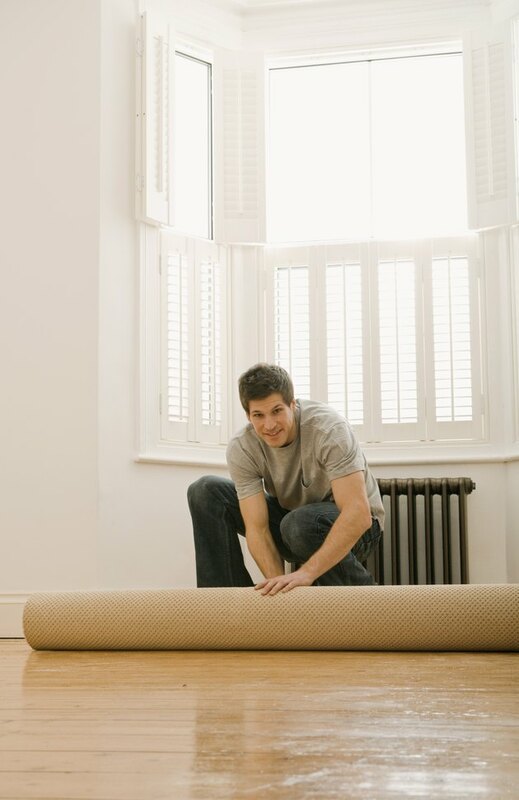 Divide the shorter side of the room on your scale drawing into sections the width of the carpet roll. For example, if the carpet is 16 feet wide and the room is 32 feet by 64 feet, you would divide the 32-foot side into two sections. If you have a remainder, it will be another section. For example, if the carpet is 16 feet wide and the room is 18 feet by 24 feet, you would divide the 18-foot side into one 16-foot section, and one 2-foot section. Mark the divisions between sections with a small pencil mark. Be sure to use the same scale you used to draw the room. Draw lines parallel to the long side of the room, starting from the division marks on your scale drawing, and divide the room into long "strips." Each strip should have the width of one section of the short side. For example, if the carpet is 16 feet wide and the room is 32 feet by 64 feet, you will have two long strips, each 16 feet wide and 64 feet long. If the room has any oddly shaped features, some strips may be longer or shorter than the rest, or unevenly shaped at one end. Measure the length of each strip using your scale drawing. Write down the length in feet for each strip. If a strip is uneven at one end (for example, the corner of the fireplace is in the middle of one strip, so the strip is L-shaped at one end), write down the longest length for that strip. Add up the lengths of all the strips. Add 6 inches for each strip to account for extra carpet needed to finish the ends. The number you get is the number of linear feet of carpeting you need. For example, for 16-foot wide carpet and a 32-foot by 64-foot room, you would have 64 feet plus 64 feet equals 128 feet total. Because you have two strips, you would add 2 times 6 inches, or 12 inches, or 1 foot. So your final total is 129 linear feet of carpeting.